Linda Bolton is one of Art History UK’s leading exhibition guides and is a highly experienced and senior art historian with extensive knowledge of London’s most iconic galleries. 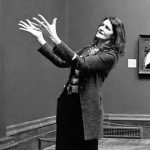 She is very senior in the National Gallery’s education department and recently featured prominently in a film about the gallery directed by Frederick Wiseman. She is passionate about the art on which she lectures, and her quirky sense of humour and perspective brings the artwork to life in a unique way. She has published a dozen books on 19th & 20th Century artists and art movements, and is currently writing a graphic novel on the French artist Elizabeth Vigée le Brun.